Well! It takes a Male HO to know One! stupid hat pat. gave the same lame advice prior to winter storm 2014.and nobody called him on it.you cant make this stuff up. Except for Scalia and Alito and Thomas and Roberts and Kennedy, there is probably no more evil force in America today than ALEC. 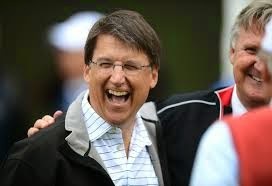 Go McCrory. Who votes for these people?! Honestly, NC voters get what they deserve. Dems better turnout the vote in November. I've never seen anything like this state. I going to provide an example of leadership failures in government that far exceeds the Governor of North Carolina. His name is Obama. MSNBC was explaining this morning why he would not visit refugee camps in Texas. His visit was to raise money for Democrats. He did not want to draw more attention to the problem for political reasons. Now that is leadership. When faced with any national crisis, his first response is to raise campaign funds. I agree, our President. His legacy will be blaming others for his poor leadership. Senator Hagan: A sad example of representation. And the top of my list is the Boone Town Council. Now talk about being puppets!!! Their refusal to work with the county on any resolution is not acceptable. Really, the Boone Town Council is all to blame?! Why wont the Commissioners bend some too? They have made this their personal vendetta to not work with the town. In my opinion they both need to put their big boy pants on and sit down and work this out meeting in the middle not expecting one side to bow down to the others demands. This is what real government is. Yes, really, Camelot. Who prevented the sell of the high school property? Who are the ones that tried to get even with Phil Templeton? Who are the ones that refused to meet with the county? All over the former Mayor getting bent out of shape over a business that Templeton wanted to start and being controlled by one local Democrat and activist. Scary isn't it. I do agree they need to sit down and hash it out, but I believe the town will not even think about doing it. The town refused to meet with the county unless they could do it in secret "closed session". The county, except for the two toadies Welch and Bobblehead Billy, maintained that the business of the public should be conducted in public. How would it have hurt the town to have a public meeting? What a stark contrast on this thread. The left whines about our Governor accepting an invitation to speak to a national organization at their annual meeting while local conservatives point to the stubborn intransigence of our local "progressive" leaders. Irrelevance apparently presents no impediment to liberal hypocrisy. Lets all put our head in the sand and only acknowledge the bad things the town has done lets ignore the vindictive Commissioners. I have been at numerous meetings where the Commissioners have used their power to in their own words punish the Town for their actions. Such as the sales tax redistribution, the denying of their appointments, and their continual fight with non profits which they insist is further punishment to the town. Camelot, you are the one who has put their head in the sand. You can not even comment on the issues the town has created.